IN PURSUIT OF THE PAST: a review of "The Face Of Love"
My Grandmother passed away during the final stretches of January at the age of 93, most notably leaving behind her husband, my Grandfather, who just reached the age of 94 in February. I actually spoke to him just this afternoon and after I had asked him how he had been getting along, he informed me of how strange it is to be in the house all alone now. That he will be preparing dinner for himself, just as he has done for years and years, and just as he is readying himself to fix a plate for my Grandmother, he remembers that she is indeed gone. My Grandparents were married for 74 years and they had known each other for nearly the entirety of their lives. My Grandfather even joked this afternoon of how they knew each other as small children "making mud cakes" outside together. It is just unfathomable to me to even begin to understand just what he could possibly be experiencing on an emotional, psychological and spiritual level with this unprecedented loss. Or, frankly, anyone who has experienced a loss similar to this one. Those feelings and his current state of existence were firmly at the forefront of my mind when I sat through a screening of Director Arie Posin's romantic drama "The Face Of Love," starring Annette Bening and Ed Harris, a film about the profound nature of love, loss and potentially finding love again, albeit under extremely unusual circumstances. While there is much to admire about the film, most notably the performances from our two wonderful leading actors, "The Face Of Love" ultimately does not probe as deeply as it needs to, therefore making for an experience that is well meaning but otherwise not entirely successful or satisfying. The opening of "The Face Of Love" provides us with a picture of romantic bliss followed by horrific tragedy. Annette Bening stars as Nikki, a woman rapturously in love with her husband Garrett (Ed Harris), while on a romantic getaway to Mexico, horrifically finds her husband washed ashore dead on the beach after drowning in the ocean the night before. Five years after Garrett's death, and while on an impulsive trip to a Los Angeles art museum they used to frequent together, Nikki spots a gentleman who bears an eerie and undeniably identical resemblance to her dead husband. Simultaneously disturbed and intrigued, Nikki returns to the art museum again and again hoping to find and meet Garrett's doppelganger, whom she eventually discovers is named Tom (also played by Ed Harris), and is an art teacher at Occidental College. Nikki soon finds herself in the middle of Tom's classroom, and soon afterwards, a friendship and romance begins to bud. For Tom, who is completely unaware of his physical resemblance to Nikki's dead husband, his romance is an opportunity to find love again, ten years after his own divorce and feelings that this aspect of life is now forever closed to him. Yet for Nikki, finding Tom, gives her the opportunity to fly into a fantasy world, a love affair where she can almost pretend that her beloved Garrett had not passed away at all and their lives can resume uninterrupted. "The Face Of Love" is a provocative and compelling adult love story that does indeed treat its cast of characters with intelligence, empathy, complexity and soul. There are no frivolous moments as Posin ensures that the emotional risks within and inherent in a story like this one are always at the forefront, a tactic that does provide the overall experience with intrigue, some surprising suspense and more than a little pain....but, I don't think that the film overall was quite painful enough. I have no qualms whatsoever with the performances from the entire cast, which also includes fine supporting work from Jess Weixler as Nikki's adult daughter Summer and Robin Williams as Nikki's longtime (and lovestruck) friend. Everyone proves to be able to find the honesty of their respective character's motivations and they all complement each other handsomely. Annette Bening remains a cinematic treasure and while her film roles are somewhat infrequent these days, whenever she does chose to appear, you can be certain that she will deliver the emotional goods and then some, and completely without any sense of vanity. As Nikki, this is no exception as she utilizes subtly to convey a world of layered and competing emotions and motivations. As Nikki's romance with Tom continues to blossom, we also witness her difficulty within herself for carrying on with what is essentially a charade. Her dishonesty with Tom, her family and friend from whom she hides Tom from, and therefore herself, provides her with serious psychological consequences, that at times makes you think that Nikki is slowly becoming unglued. And yet, Posin accomplishes a truly difficult feat, he makes us completely understand why she does what she does because he firmly inserts us into how she is feeling from the film's opening frames. How is one able or even supposed to go on with life when the love of your life has exited forever, either through a breakup or through death itself? And if you were able to somehow achieve the impossible, to regain what is forever lost wouldn't you try to grasp it too? Nikki's inner and romantic dilemma radiates from the screen and Annette Bening has richly served as the conduit. For Ed Harris, I cannot remember when I have happened to see him express a side that has been so uncompromisingly tender and even vulnerable. 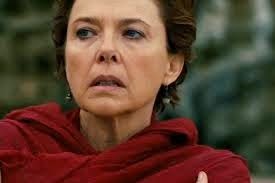 While I do think it would be more than a little easy to pretend to fall in love with Annette Bening for a movie, Harris injects his role with such rugged soulfulness that we find ourselves aching for his happiness, as we know all the while that he is indeed being deceived and is fully unaware of how and why Nikki has entered his life. Nikki;s inner turmoil does lead to several instances of erratic behavior that finds poor Tom sizably confused, but we see how he remains steadfast, true, strong and not in a prefabricated way, but as an older man who does not want to lose what he thought that he would potentially never see again. Furthermore, Tom possesses a secret of his own that also fuels his desire to keep whatever building passions aflame with Nikki, perhaps even against his better judgement. "The Face Of Love" succeeds best as a romance for older individuals and how Posin shows that the act of attraction, connection and falling in love is as awkward as it is during adolescence, signifying that perhaps over time, we don't change as much as we think we do. But conversely, adolescents typically do not have the baggage of a long life to shoulder along with possibly finding love with another soul and in the case of Nikki and Tom, disappointments, divorce and death all figure into the possibilities of growing something new, making their emotions especially precarious. Arie Posin deftly remains in tune with those qualities throughout the film and because he did accomplish those particulars so well, I wished that he had been able to handle other elements equally as well. First of all, the longer the film continued, the more melodramatic it became and finally succumbed to a series of cliches that made the film feel much to tidy considering the complexities of the characters and their story. The writing never really probed as deeply as it needed to, as far as I was concerned. Much needed conversations between Nikki and her daughter, plus Nikki and the Robin Williams character both occurred off screen, making me feel that Posin and his co-screenwriter didn't feel like addressing those concerns explicitly, which is most unfortunate as those unseen sections would certainly have added a greater richness and power to the material. Nikki's psychological state certainly warranted more attention than it received as well. There were too many scenes displaying Nikki's increasingly erratic nature in Tom's presence that it felt odd to me that Tom would not be either asking deeper questions or just flat out running away from her altogether. The film's final sections, for me, were the weakest when they should have been the strongest, as the film eventually nose-dived into a calculated sense of melodrama that was unnecessary and conclusions that were terribly too tidy and all set to Composer Marcelo Zarvos' syrupy and invasive score, which was determined to tell the audience what and how to feel from start to finish. What could have become a truly wrenching drama about the nature of loss, just became a somewhat prefabricated weepie that will undoubtedly make some viewers cry (as did several members of the audience I saw it with) but for me, it felt to be falsely manipulative when it certainly did not have to be. "The Face Of Love" is not bad film by any means at all. It was one that just didn't move me as much as I had hoped it would. Apparently, the film is based upon the personal experiences of the director as Posin has stated that after his own Father's passing, his Mother one day claimed that she saw a gentleman who was indeed identical to her late husband. Yet, unlike Nikki, Posin's Mother did not pursue this gentleman. Hearing that story, I wondered just what emotions his own Mother experienced. Some of them undoubtedly made it into this film but I think if he had fully adhered to his Mother's experiences, and trusted completely in the inherent drama and tragedy and funneled that into the movie, "The Face Of Love" would have undoubtedly been one to remember. As it stands, "The Face Of Love" is a very well acted and very well intentioned near miss. A STUPENDOUSLY GRAND VISION: a review of "The Grand Budapest Hotel"
“That’s the kind of movie that I like to make, where there is an invented reality and the audience is going to go someplace where hopefully they’ve never been before. The details, that’s what the world is made of." "The Grand Budapest Hotel," the eight feature film from Writer/Director Wes Anderson is a stupendous wonderland, magically rendered and blissfully executed. For all of the imagined worlds that Anderson has already devised for us in the past, from the prep schools of "Rushmore" (1998) to the underwater spectacles of "The Life Aquatic With Steve Zissou" (2004) and to even the graceful stop motion of "Fantastic Mr. Fox" (2009), "The Grand Budapest Hotel" is not only Anderson's most visually resplendent film to date, it is also a film that is so unabashedly unfiltered and presented without regard for anything any potential detractors might have to say about it, thus making it a work of pure freedom and unrepentant liberation. For my tastes and sensibilities, "The Grand Budapest Hotel" is not only Wes Anderson best film in many years, I am strongly feeling it to be my favorite film of his since the likes of "The Royal Tenenbaums" (2001) and the melancholic Middle Eastern dream world of "The Darjeeling Limited" (2007). Even further, I also feel that it has already earned a spot on my listings of my favorite films of 2014! "The Grand Budapest Hotel" represents a major statement from a filmmaking artist who, still quite young and has already amassed a large, treasured body of work, has created a film that feels as if he is just getting started. BRAVO!!!!! I have to say that it would be more than a little difficult to really explain to you the basic plot line of "The Grand Budapest Hotel" as the film is decidedly much more labyrinthine than the film's trailers may make it appear to be. This is not a criticism by any means. Just more of a thrilled observation as we are indeed ensconced in a "high concept" era where nearly every film can be reduced to a one sentence description. By contrast, Wes Anderson has heroically countered that level of instant gratification by immersing us in a luxurious yarn that spans four time periods, but mostly takes place in the mythical European Republic of Zubrowka circa 1932, with the final glory days of the titular hotel as the central point. Ralph Finnes brilliantly stars as Gustave H., the Budapest Hotel's devoted and masterful concierge, a fastidious yet roguish gentleman with a penchant for romancing wealthy octogenarians, in the case of this film's story, the 84-year-old Madame D. (a completely unrecognizable Tilda Swinton). When Madam D. unexpectedly dies under mysterious circumstances, Gustave H. is thrust into a murder mystery that involves a missing will, a stolen painting entitled "Boy With Apple," daring prison escapes, ferocious villains (played with gleeful terror by Adrian Brody and Willem Dafoe), youthful romance, delectable baked goods, rapid snowy chases through the mountains and at the core, the developing friendship between Gustave H. and the young immigrant and hotel Lobby Boy in training, Zero Moustafa (wonderfully played by Tony Revolori). 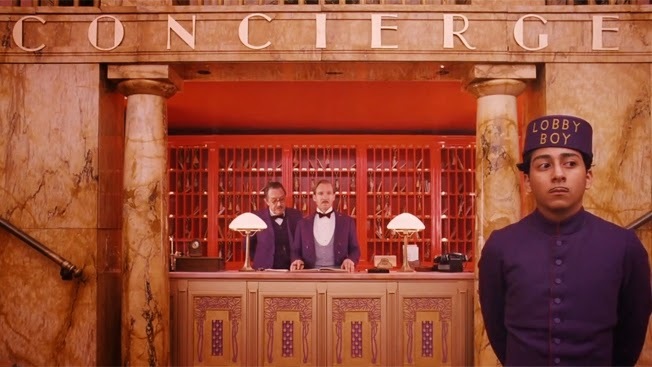 Long have I lamented the increasing lack of vision, imagination and creativity on display in 21st century cinema and how gloriously happy I was that by the first frames of "The Grand Budapest Hotel," Wes Anderson nearly single-handedly brings all that is sorely lacking back to the silver screen in the most lavish display he has accomplished yet. This is a frisky film that hurtles by on seemingly the sheer velocity of how quickly the ideas happened to arrive in Anderson's brains. But rest assured dear readers, this film is not some collection of random daydreams barely stitched together. Really, this is a Wes Anderson movie where all of the details are meticulously conceived and painstakingly designed to work together to formulate a seamless package, making the entire invented universe full, rich, complete and without any cracks or blemishes whatsoever. As we live in an era of groundbreaking special effects that aren't special, where the CGI technology that can create anything you can possibly imagine but only seems to manage explosions and all manner of crashes, "The Grand Budapest Hotel" goes a profoundly long way in showing the artistry and magic of actual set, production and costume design. While there are certainly some digital special effects to be seen, the film truly feels less like the work of computers for other computers and decidedly more like we are witnessing the work of immensely creative individuals working at the top of their respective crafts, utilizing human hands to fulfill the singular artistic dreams of the primary filmmaker at the helm. I certainly hope that the short memory span of the Academy Awards community does not come into play in regards to this particular film as it has been released so early in 2014. But believe me, this is a film that is a constant and delightful sight to behold, so much so, that I am echoing some other critics who have mentioned that audience members may wish to have remote controls to stop the film to just have the opportunity to study every detail that has been so lovingly placed upon the screen. One year from now, if Cinematographer Robert Yeoman, Production Designer Adam Stockhausen, Costume Designer Milena Canonero and Set Designer Anna Pinnock are not nominated and celebrated for their tremendous work on this film, copious and unforgivable cinematic crimes have been committed for their work on this film is astounding. And yet, "The Grand Budapest Hotel" is not solely a visual masterpiece, it is a conceptual one as well as Wes Anderson's screenplay (his first solo screenplay at that) magically works in lockstep with the visuals on display and somehow makes room to feature seemingly everyone who has ever taken part in a Wes Anderson film in surprising, fully convincing and most accommodating fashions. Ralph Finnes superbly ingratiates himself within Wes Anderson's film universe by bringing to life a character that is not out of step with several of Anderson's other industrious yet rascally scoundrel leading men in films past (I am chuckling with the thought of Gustave somehow being involved in a high stakes card game with Royal Tenenbaum, Steve Zissou and Mr. Fox--oh, the stories they would tell each other). Yet, Finnes also makes Gustave exist so vividly on his own terms. Finnes, usually so brooding and tortured in the roles he chooses to take, appears to be just as liberated as Anderson with this role that is by turns dashing, persnickety, duplicitous, shameless and virtuous. He is absolutely wonderful! Additionally, Wes Anderson's screenplay is a masterpiece of construction, plotting and most especially, language, a quality that makes the film a sheer delight to listen to, as hearing dialogue so freshly inventive has become so increasingly rare. Furthermore, I actually hope that the screenplay is published in a book format as I am certain that it would be just as delightful to read, thus provoking the thoughts that Wes Anderson could also become a fine novelist should he ever choose to follow that path. But again, there is that ever present criticism of Wes Anderson's films that they are all artifice with no substance whatsoever, a criticism I have vehemently disagreed with time and again. As I have always expressed concerning his films, Wes Anderson somehow possesses the gift to create these artificial landscapes and environments but somehow houses them in emotions that are so deeply true. In the case of "The Grand Budapest Hotel," the ache and melancholy lurking at the seams of the story becomes more palpable as the film continues onwards. The film takes place during a period when the world is on the brink of war and Anderson does pepper his film with issues of racism and even some surprising bits of surrealistic yet graphic violence. Most of all, "The Grand Budapest Hotel" contains a profound sense of mournfulness as it is decidedly a highly romantic film, the kind of which is designed to leave you heartbroken. The film is a romance for a era and time of Old Europe, even a dreamworld Old Europe like the one depicted here. The film is also a romance of friendships long gone but deeply cherished and eternally remembered as well as paying homage to the early romances that shape us and at times, break us. It is a film that possesses a love affair with art, travel, pursuits, mysteries and escapes, a quality which then makes the entire film a romantic ideal for the art of storytelling and the storytellers who weave the dreams for listeners to find themselves lost inside of and transformed by. If that is not substantive enough for you, then I don't know what else could be. But for me, it makes "The Grand Budapest Hotel" the very type of film I am already itching to see again, as well as add it into my personal collection in the future! Wes Anderson's "The Grand Budapest Hotel" is a sumptuous feast and succulent fantasia. It is a film that demonstrates vibrantly that Wes Anderson is a filmmaker who has chosen to completely serve his artistic muse and not play it safe. That he is working at the fullest command of his creative powers by making a film in a way that could not be made by another filmmaker than himself. That is filmmaking artistry to me and "The Grand Budapest Hotel" is a voluminously entertaining piece of cinematic art. As I anxiously await the arrival of Writer/Director Wes Anderson's latest opus, "The Grand Budapest Hotel" to arrive in my city this coming weekend, I am just so excited to share with you something that I have been keeping in my "back pocket" until this perfect time, something that I received as a gift this past Christmas and when I opened it up, I knew that Santa Claus was very good to me!! "You don't have to pull up a lot of reviews to find people that hate what I do...Maybe they would hate my movies even more if I took away the things they say they hate, but at a certain point, what am I going to do? I don't read minds, so I guess I'll just do what I want to do. And what I want to do has a lot to do with what I enjoy about movies." This particular criticism of Wes Anderson's films, that he is somehow an inauthentic filmmaker, is something that I can understand to a point simply because it is not expected that every single viewer will indeed enjoy the kinds of movies that Wes Anderson makes, especially in the style that he makes them. For instance, and as I expressed to you in the questionnaire I posted recently on this blogsite, while I do respect filmmakers like David Cronenberg and David Lynch for being the idiosyncratic figures that they are, many of their works just do not appeal to me. But for Wes Anderson, it seems as if there is the tendency to not even concede any respect to him as a filmmaker who possess his own singular creative vice and vision during a time when such American filmmakers are in such short supply. While The Wes Anderson Collection will certainly not make converts of any of Anderson's detractors, I do think this excellent book, so lavishly and meticulously produced and presented (much like Anderson's actual films), will go a long way to providing those people with copious amounts of insights into Wes Anderson's creative process and the deep sincerity that lies at the heart of his chosen craft. And furthermore, for us fans, this book is further vindication that he is truly one of the finest cinematic auteurs we have working today. In true innovative fashion, The Wes Anderson Collection is not presented as a straightforward biography or as a standard book of film analysis. Rather film critic/filmmaker/author Matt Zoller Seitz has concocted a reading experience that merges the literary, journalistic and the visual absolutely brilliantly and in a way that perhaps any of Anderson's most industrious characters may have devised themselves. Let me give you an insight into what you will experience should you choose to pick up a copy of this very reasonably priced and essentially coffee table sized book by describing the contents of the section devoted to the film "Rushmore" (1998). -See the inspiration for the school crests depicted in all three of the film's fictional educational facilities. -See how Tom Cruise circa Paul Brickman's "Risky Business" (1983), Noah Taylor in John Duigan's "Flirting" (1991) and even early 1960's era Mick Jagger all inspired the look of the character of Max Fischer (Jason Schwartzman). -See how The Kinks, Devo and Vince Guaraldi's classic music for the television "Peanuts" specials all played a role in the film's celebrated soundtrack. -See how the visual/cinematic designs of works as seemingly disparate as Orson Welles "Citizen Kane" (1941) and "The Magnificent Ambersons" (1942), Elia Kazan's "On The Waterfront" (1954), Francois Truffaut's "The 400 Blows" (1959), Mike Nichols' "The Graduate" (1967), Hal Ashby's "Harold And Maude" (1971), Michael Cimino's "The Deer Hunter" (1978), Tony Scott's "Top Gun" (1986), and even Jonathan Demme's "The Silence Of The Lambs" (1991), plus the work of graphic designer Saul Bass, all extended themselves seamlessly into Anderson's own cinematic aesthetic in lavishly illuminating shot-by-shot comparisons. -In this section, you will also be able to witness hwo the legendary work of "Peanuts" creator Charles M. Schulz played a hugely significant role in the creation of "Rushmore," through characters, situations and even wardrobe choices. And if that still was not enough for you, The Wes Anderson Collection presents this exact same amount of material for each and every one of es Anderson's films from his debut feature "Bottle Rocket" (1996) all the way through to "Moonrise Kingdom" (2012) and even includes the stop motion animated "Fantastic Mr. Fox" (2009). It's ALL here!! Since receiving this book, I have poured through the sections devoted to "Rushmore" and "The Royal Tennebaums" (2001) feeling completely enraptured to have been given the opportunity to see how this filmmaker has actually accomplished all that he has. To see the amount of thought, inspiration and sheer devotion to the world of cinema that he has placed into his own works has not only been profoundly enlightening and inspiring, I have found myself not only wanting to view these films all over again, now armed with fresh insights. 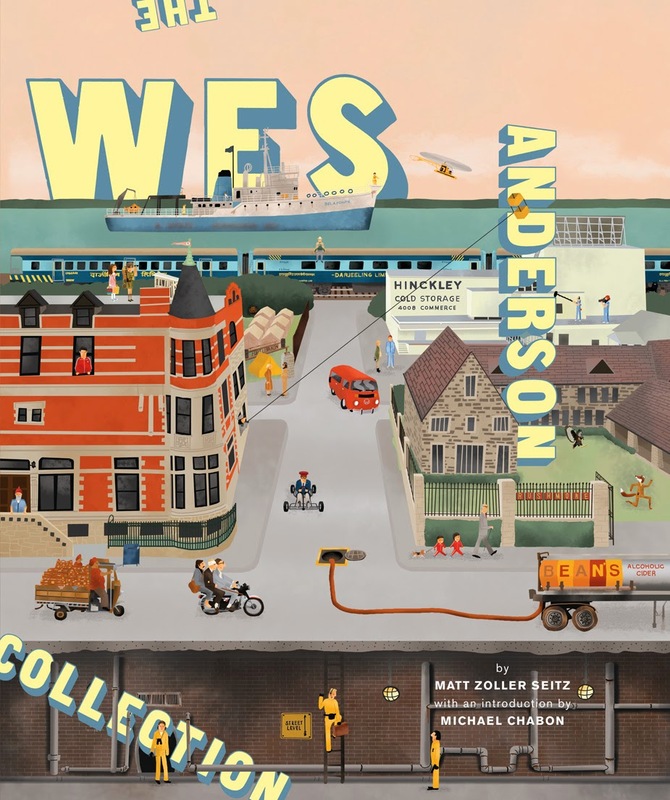 I am anxious to dive into the remaining sections of the book and I am just certain that if you love Wes Anderson as much as I do, this book is undoubtedly the perfect companion piece. "It's not like I want to announce to the audience, 'We're gonna do this in one long take, and we're gonna move over here, and we'e gonna have smoke come through, and then we're gonna pan over there, and then we're gonna have a whatever-it-is, a this part will be in slow motion thing.' None of that is meant to be deliberately taking you out of the movie. It's supposed to make it better." Amen to a filmmaker, still so young and who has already accomplished so very much, who is always aspiring of ways to just make his films better, better enough so they can be the very best films they can possibly be. If that is not an artist, especially in these instant gratification times, then I do not know what is. 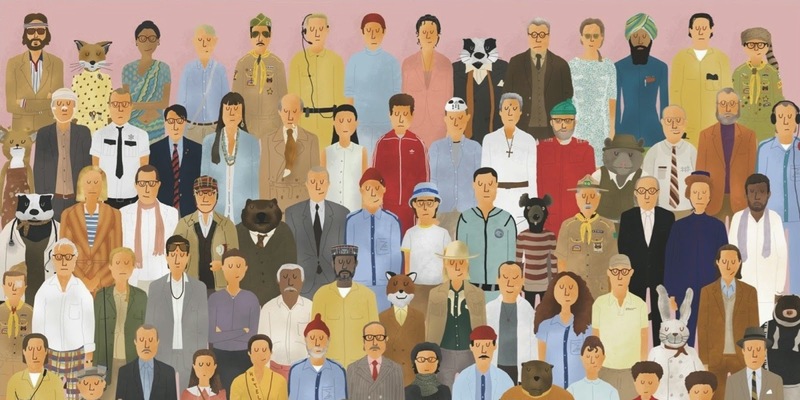 The Wes Anderson Collection effectively captures it all in one place, a most handsome package that I am certain that you will excitedly enjoy opening again and again. Chicago. What else can I say? It was my kind of town. Was anyone else in your family into movies? If so, what effect did they have on your moviegoing tastes? Before my eyes were opened to the movies, I do not think that there was any other family member that was passionate to the degree that I am. My family did go to the movies. My family enjoyed going to the movies. But in my early years, all the movies were for me was just another place to go and to, of course, possibly have some popcorn. I remember seeing "The Bingo Long Travelling All Stars & Motor Kings" (1976) as well as "Rocky" (1976), but typically, I tended to fall asleep in the movie theater. That's really hard. I do have a vague memory of seeing "Bambi" (1942) but all I remember from it was a fire sequence. If that was the first one I saw in a move theater, I just don't know. Now, the first to make an impression upon me was certainly "The Wizard Of Oz" (1939). I was perhaps four or five when I saw that for the very first time and I loved it!! Without realizing it, that movie was the very first to show me how the medium and language of film can be a completely enveloping experience that at its best is a level of storytelling that is entirely transportive and everything just feels to be so real, even when it is all so obviously make believe. That scene where the Wicked Witch has Dorothy captive in the castle, and she turns the hourglass over and tells Dorothy that she will die when the sand runs out...man, I was TERRIFIED!! My older cousin Susan was watching it with me and of course, she had seen it. But no matter how hard she tried to assure me that Dorothy would be saved, I just did not believe her until I saw it for myself. That movie left an impression! What's the first movie that made you think, "Hey, some people made this. It didn't just exist. There's a human personality behind it. "Star Wars" hands down, which I saw at the age of eight on its opening day in 1977!!! That was the very first movie I saw where movies and the moviegoing experience hit me like lightning. Before I went inside the theater that night, the movies were just another place to go. The moment the movie began and definitely by the end, it was like I had an out of body experience. George Lucas was the first filmmaker I was ever aware of as being a person who made movies as their chosen job and so, my eyes were completely opened. It was like I said to myself, "AHHHHHH!!! MOVIES!!!!!!!!!!!!!!!" Ha ha ha!! That's easy! It was during a special advance preview of "The Champ" (1979) starring Jon Voight and Ricky Schroder in his debut performance. I was 10 years old and my family plus two older cousins went out to see the PG rated re-released version of "Saturday Night Fever" (1977) and "The Champ" was a preview being shown right afterwards. I believe that you just always know when a movie is not working for you and believe me, I just HATED this thing instantly. It was so saccharine, so maudlin and such a prefabricated, overdone weepie as this kid (and seemingly everyone in the film) was just crying and carrying on and on and on and I could not stand it at all. After a while, I leaned over to my Mom and asked if we had to keep watching this movie. She then leaned over to my Dad and whispered, "Scott wants to leave." And as if the sharpest electrical current zapped through my Father's theater seat, he leaped upright before I even realized and he announced to the family, "Let's GO!!" In the car, we all realized that everyone in the family was hating the movie just as much as I was but thought that each other was enjoying it, so nobody wanted to be the one to pull the plug on the evening. To date, "National Lampoon's Animal House" (1978) is my favorite comedy! Paul Thomas Anderson's "Magnolia" (1999) leaves me as a dish rag every time I have seen it. It is just such an emotional steam rolled and such an overwhelming experience--especially during its second hour--that my only reaction is to cry and cry. But, believe it or not, I think "A Boy Named Charlie Brown" (1969) possesses such a powerfully deep and profound sense of melancholy that my heart just falls every time I have seen it (especially when poor Charlie Brown loses the spelling bee over the word "beagle"), even though I cherish it. I felt that way when I saw it as a child, and it just amazes me how children can easily recognize those emotions of failure, disappointment, and insecurity and this film carries those emotions so honestly, that it makes any sense of uplift and messages of perseverance that much more meaningful. "Poltergeist" (1982), without question. The experience of seeing that film for the first time--and in the afternoon--was so voluminously intense and horrifying that it is one experience that I have never had in quite the same way since. It worked me over--two times!! But, as a second choice (sort of), the "opening the Ark" sequence in "Raiders Of The Lost Ark" (1981) ranks near the very top as being one of the most terrifying things I have ever seen. I can still vividly remember shielding my eyes once those faces began melting. Also without question, John Hughes' "Sixteen Candles" (1984). The hope, the yearning, the heartbreak and ultimate vindication that the one you secretly love the most will someday notice you and your self worth and then even reciprocate your love so purely and truly, as represented by Samantha and Jake sitting on that table with the birthday cake between them, lifted my 15 year old self through the clouds when I first saw it...and it still does to this day. It is a film with a perfect movie kiss and it is also a perfect ending. Just soaring in its beauty. It may have been some viewings of "Hill Street Blues." That was possibly the first show to make me experience a variety of different and darker emotions. I have read Judy Blume's Tales Of A Fourth Grade Nothing more than any other book in my life as I read it every year to my group of students. For me, that book is my Charlotte's Web. But my favorite book of all time is John Irving's The World According To Garp. I listen to music infinitely more than I eve watch movies so it would be impossible for me to figure out which album or artist I have listened to the most. That being said, my #1 favorite album is "Abbey Road" by The Beatles and my personal musical "Holy Trinity" features The Beatles, Todd Rundgren and Prince. Darren Aronofsky's "Requiem For A Dream" (2000). It is brilliant but it is a ride too brutally disturbing for me to ever sit through again. I honestly do not know but it is quite possibly a John Hughes title as I can quote those films unlike any others. "National Lampoon's Animal House," and absolutely yes. I loved the sheer anarchy of the entire thing even though my 9 year old brain could not even begin to process the actual content of the jokes. Once the jokes became clear to me by Middle School, I was just dumbfounded that I actually wore my parents down so far that they conceded to even let me see it...and then, not whisk me from the theater while we were there! That is really hard!!! I'll toss out two that made my eyes POP. The French film thriller, Jean-Jacques Beineix's "Diva" (1981) and also Ridley Scott's "Blade Runner" (1982). And Stanley Kubrick's visual compositions are, and will forever be, unmatched. This is also very hard for me (as is the next question) as I don't tend to rank actors very much. I either respond to them or I don't and there are some that are personal favorites. From the past, perhaps Jimmy Stewart and Henry Fonda. From the present, Denzel Washington is one of the best we have ever had (although he needs to chill on the brain dead action movies), and I love Leonardo Di Caprio and Tom Hanks as well. John Cusack has truly been a hero to me through his romanticism and subversive cynicism, Tom Cruise has never elicited a lazy performance in his life and I deeply appreciate is 1000% commitment to a role and when I was growing up, Sean Penn was my Robert DeNiro. While not a movie, Bryan Cranston's work on television's "Breaking Bad" was one of the finest performances I have ever seen. And of course, the late, great Philip Seymour Hoffman was, again without question, the very best of his generation. Oh boy...hmmm...from the present, Kate Winslet can do no wrong! I love Julianne Moore, Naomi Watts, Frances McDormand and Annette Bening as well. But I think quite a few leading actresses I love have been mostly featured on television like Amy Ryan from "The Wire" and "In Treatment" and most certainly, Julia Louis-Dreyfus. From the past...hmmm...I thought that Elizabeth Taylor was a powerhouse in "Who's Afraid Of Virginia Woolf?" (1966). Hmm...can I get back to you on that one? I don't have just one. But my favorites (that are currently working) are/remain Steven Spielberg, Martin Scorsese, Woody Allen, Cameron Crowe, Quentin Tarantino, Christopher Nolan, Spike Lee, Judd Apatow, Terry Gilliam, Richard Linklater, The Coen Brothers, Wes Anderson, Paul Thomas Anderson, Sofia Coppola, and Clint Eastwood. Michael Bay is the death of cinema. "Sgt. Pepper's Lonely Hearts Club Band" (1978), starring Peter Frampton and The Bee Gees has been long acknowledged as being one of the worst films ever made and yes, I am the only one who has ever loved it. Most of the films by David Cronenberg and David Lynch are ones that do not appeal to me at all. I hated David Lynch's "Blue Velvet" (1986) when I saw it as a teenager and I have never understood its appeal at all. I just find it to be obvious, not the least bit provocative, totally overwrought, more than a little cruel and also more than a little stupid. Aside from "Star Wars"...well, there was most definitely the release of "The Blues Brothers" (1980), the film that singlehandedly revived Chicago as a primary filming location for Hollywood productions. This was an EVENT movie if there ever was one and a time when all of Chicago banded together in unison for a non-sporting experience. We tried and tried to see that movie on three separate occasions, each time waiting is epic long lines outside of the River Oaks theater only to be turned away with a "SOLD OUT" sign every time. The fourth time we tried, we got in and it was nearly as much of an out of body experience as "Star Wars" was as I could not believe what I was seeing. Another cherished moviegoing event was the night my family and I saw a double feature of Milos Forman's "Hair" (1979) and Alan Parker's "Fame" (1980), two sensational and euphoric films that made me graduate to more adult themes and concepts via a format I could understand, the rock musical. Aside from seeing commercials and seeing previews that essentially tell the entire movie in two minutes thus completely negating the purpose of seeing the full length film in the first place, I cannot stand how some theater chains jack up the volume on coming attractions trailers to an ear splitting degree and the main feature is presented at the normal movie theater volume (in most cases). I know the powers-that-be want to grab the audience's attention but if an audience member cannot notice the images upon the giant movie screen, then what is making the audio element deafening going to do? Also I cannot stand seeing children attending films that are clearly inappropriate for them to view. I know the ratings system is deeply flawed but when it comes to what is acceptable for small children to watch or not watch, the ratings system is perfect and parents just need to be more proactive in attaining the information so that they can make wise choices for their kids. Seeing films in 70MM and Dolby sound. But even more, I just miss the imagination, the level of creativity, the risk taking and the personal statements filmmakers could make as they are in increasingly short supply compared to when I was growing up. Of course not. They're just movies. 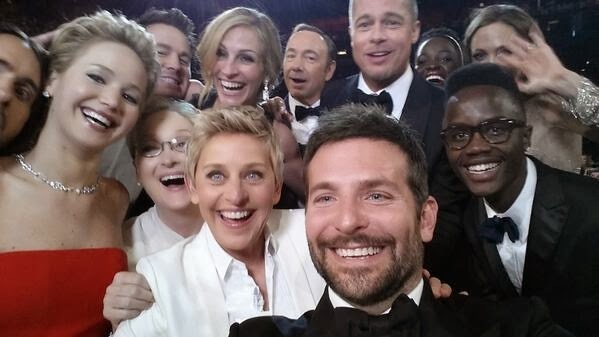 The above photo, the very one that has now set the record for being the most re-tweeted photograph in history, the very one that caused Twitter to crash for a spell, precisely represents what the Academy Awards telecast has not been for more years than I can remember: FUN! Yes dear readers, last night's Oscar telecast was finally, at long last FINALLY, the very show it has desperately needed to be for eons, one that was legitimately entertaining, considerably faster paced, and surprisingly and honestly funny from one end of the show to the other and for that achievement, which is no small feat, we must thank our wonderful hostess Ellen DeGeneres. I have no idea of what it is that has made the act of ensuring the Academy Awards broadcast just be an entertaining television program in its own right such an impossibility for many years but it has been a brass ring that has remained consistently elusive...until last night. I have no idea if producers have changed or if past writers have been jettisoned but last night's show seemed to be more inspired by what actually makes the Golden Globes telecast work so well (lightning pace, copious amounts of readily available alcohol for the celebrities), and the powers-that-be decided to make their program one that was less stuffy and ponderous while simultaneously celebrating the art and artistry of the movies. While I have been a longtime admirer of Ellen DeGeneres, I have to admit that I was more than skeptical of her hosting duties as it just seemed that no one, no matter who they were could save the sinking ship of the Oscar telecast but by the program opening minutes, I was a believer, and by the show's conclusion, I would welcome her back for next year with open arms should she choose to return. Ellen DeGeneres made for an absolutely wonderful and completely disarming hostess as she never for an instant seemed to be operating out of her depth, and she was never intimidated by the grandeur of the Oscars. In fact, she very wisely let the air out of the balloon for the entire evening, as her impish humor made the Oscars extremely light on its feet. I loved how the program began with no bloated opening production numbers whatsoever. Just Ellen in pure stand-up mode, just being herself was perfection and within the first 15 minutes the Oscar for Best Supporting Actor was delivered and even more Oscar awards were presented in rapid succession. Once Jim Carrey arrived on the scene as a presenter and Pharrell Williams performed by Oscar nominated song "Happy" from "Despicable Me 2," which featured Williams shimmying with the likes of a very game Amy Adams, the Oscar telecast completely loosened its ties, kicked off their heels and became a party--exactly what the Oscars should be. Having Ellen DeGeneres roam the audience was a masterstroke as that tactic made the show looser and considerably more unpredictable in its presentation, a tone that made the actors and celebrities let down their guard over and again and Ellen's pranks were just delightful. The Twitter photographs notwithstanding, the running gag of the night being the ordering of pizza, actually having the pizza delivered, distributed and then shaking down the stars to pay for the tip on the spot ("Where's Harvey Weinstein??" DeGeneres sharply quipped) was just fantastic and you could see by that stage, that whatever tensions and anxiousness that must obviously permeate that room on that night were rapturously dissipated. Even allowing acceptance speeches to run comfortably and without having the orchestra blast them off of the stage also made for a more relaxed atmosphere as well as provided moments that felt to be more genuine than in years past as the recipients didn't have to rattle off names and such just to literally beat the band. And besides, they've just won an Academy Award! So, let them have their moments, especially as we do want to see them! And then, just those random moments that made the show so wonderfully touching and exciting at times. Like when the iconic Darlene Love sang the roof off of the theater during an acceptance speech for the Best Documentary Film victory for "20 Feet From Stardom," and my man, Bill Murray spontaneously jumped out of his seat to give her a standing ovation. Or another moment featuring Bill Murray when he tossed in an impromptu tribute to his recently fallen compatriot in comedy Harold Ramis made me cheer along with him and the audience. Even the "In Memorium" section was finally appropriately tasteful and not an applause popularity contest (although I still think that they didn't need Bette Midler to sing afterwards--it kind of belabored an already elegantly made point of remembrance), another reason to be thankful. Even the musical performances for Best Original Song, a section of the show where I typically get up and pace the room for a few minutes, kept me riveted in my seat. Except for that insufferable "Let It Go," which was the obvious clear winner as it was the most traditional sounding song (and hey, it's from Disney), the nominated selections were also a bit riskier than in years past which made for more unpredictable performances. In addition to Pharrell Williams' joyously performed "Happy," Karen O's "The Mooon Song" from the film "Her," was short, sweet and to the point without being cloying. And then there was U2, a band synonymous with operatic grandeur and visual dynamism on stage, delivering raw, real, rock and roll power in the most bare bones fashion they have done...perhaps..ever? They were stunning! As for my Oscar predictions, well, I am a bit pleased with myself as I was straight on the money aside from Best Original Screenplay and Best Picture, two categories where I made incorrect predictions but I could not have been any happier to have been wrong. Written by Spike Jonze, "Her" was the definition of the most original screenplay of the year and as I have been saying for months, "12 Years A Slave" was the movie of 2013 and I am so thrilled that Oscar did the right thing by bestowing its highest honor for that film. To that end, it was a massively victorious evening for Alfonso Cuaron's "Gravity" which swept the night is ALL of the right categories. The awards delivered to "Dallas Buyers Club" have made me more anxious than ever to finally see that film now that it is on DVD. And I'm also thrilled that Oscar didn't fall for the con and the dreaded "American Hustle" went home empty handed. But I think, at the core of the night there was a moment that spoke to the magic of the Oscars that makes it the annual event that is has always been for me and so many others, including those who took home the trophy last night. It was during the acceptance speech for the Best Animated Short Film winner "Mr. Hublot," and I saw the director's hands just SHAKING with nervousness. It was a moment that signified that one you strip away all of the politics and horse race aspect of the Academy Awards, there is still room for that artist who at one time had an idea and never though him or herself to ever be standing upon that stage giving thanks and holding the gold statue in their hands but definitely wished for it. It was a moment of dreams realized and how powerful those dreams have always been and will forever continue to be. That was the gift of last night's telecast of the Academy Awards, a gift for the victors as well as the viewers and for all those who still continue to dream...like myself! Now that was a great show! Let's do it again next year and now that the bar has been raised again, you can't go back! 1. Writer/Director Wes Anderson returns with his latest fantasia, "The Grand Budapest Hotel" starring Ralph Finnes and what seems to be the entire collective of players who have appeared in previous Anderson efforts. Aside from the film, which has already been receiving highly positive reviews from the film festival circuit--notice that are making my anticipation for the film even higher than it already is--I will also have a supplemental Wes Anderson feature, either before or after I see the movie, as a companion posting. 2. Also returning are The Muppets in "Muppets Most Wanted," the sequel to Actor/Co-Writer Jason Segel, Co-Writer Nicholas Stoller and Director James Bobin's terrific 2011 feature "The Muppets." Although Segel is not involved with this installment, it is good news to know that Stoller and Bobin are still at the helm of this new adventure which also features the talents of Ricky Gervais and Tina Fey. ...And as always, I'll see you when the house lights go down!